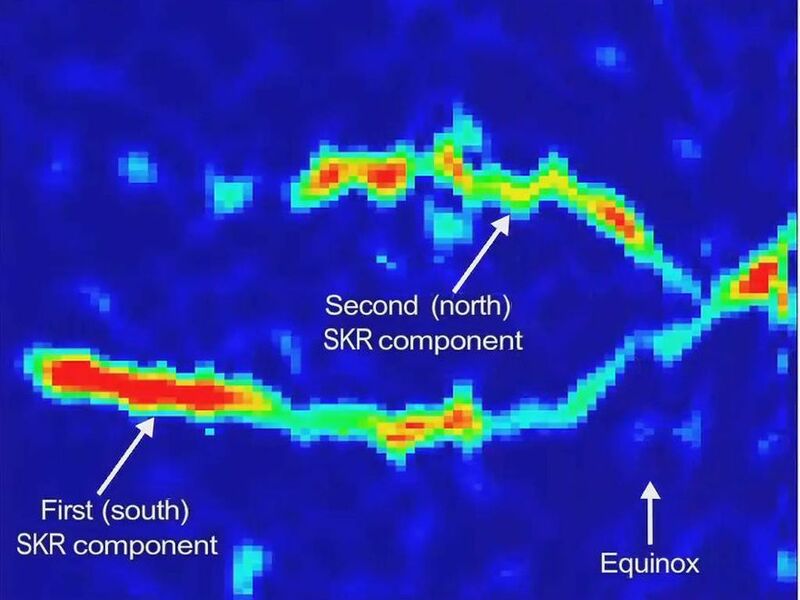 Recent data from the radio and plasma wave instrument show that the variation in radio waves controlled by the planet's rotation is different in the northern and southern hemispheres. Moreover, the northern and southern rotational variations also appear to change with the Saturnian seasons and the hemispheres have actually swapped rates. 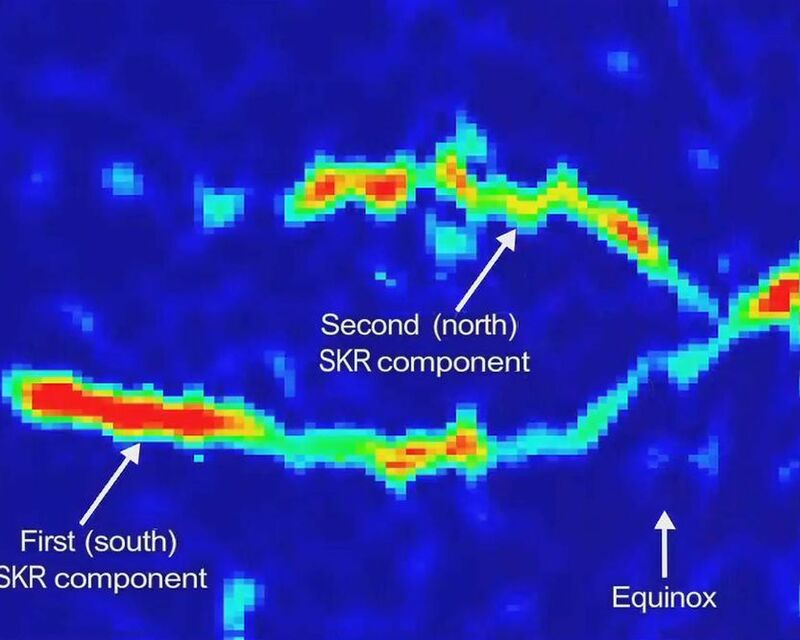 These two radio waves, converted to the human audio range, can be heard and seen in the new video. Saturn emits radio waves known as Saturn Kilometric Radiation. To Cassini, they sound a bit like bursts of a spinning air raid siren, since the radio waves vary with each rotation of the planet. 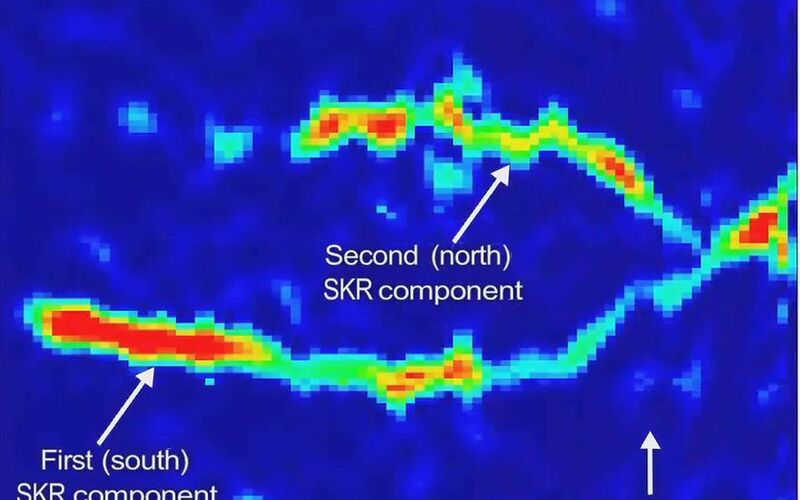 This kind of radio wave pattern had been previously used at Jupiter to measure the planet's rotation rate, but Saturn turned out to be much more complicated. The data shown here cover a period from 2004 to late 2010. Saturn's equinox, when the sun shone directly over the planet's equator, occurred in August 2009. That marked the beginning of spring in Saturn's northern hemisphere. 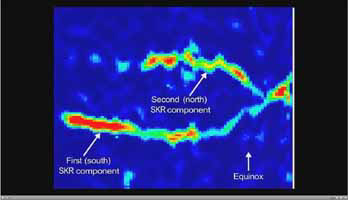 The crossover of the radio wave variations occurred around March 2010, seven months after equinox. The colors indicate the emitted power of the radio waves, with red as the most powerful. The vertical axis represents the rotation rate inside Saturn, from 11 hours at bottom to 10.4 hour at top. The bottom axis, representing time, spans from 2004 at left through 2011 at right. The Cassini-Huygens mission is a cooperative project of NASA, the European Space Agency and the Italian Space Agency. NASA's Jet Propulsion Laboratory, a division of the California Institute of Technology in Pasadena, Calif. manages the mission for NASA's Science Mission Directorate, Washington, D.C. The radio and plasma wave science team is based at the University of Iowa, Iowa City.